Our favourite fruits this month have to be RTE Avocados which are of a very good quality at present, along with our juicy Mangoes and Grapefruit. Seville Oranges are just perfect for making your own homemade Marmalade! We have now moved onto South African Black and Green grapes, they are scrummy! If you are looking for a good English Apple, please try our Cox as they are outstanding, or alternatively we have some nice crunchy Royal Galas from Europe. Blood Orange not only are they a great source of Vitamin C, they are a fantastic colour, so vibrant and eye catching! We cannot get enough of our lovely winter veggies! We have local Swede and January King Cabbage grown in Somerset. Superb Leeks and Curly Kale both UK grown. To top it all off we have a fantastic Tri Coloured Chantenay Carrots which are proving very popular – Mmm delicious! There has been a signi cant increase again in the market price of dairy goods including cheese, milk and cream. We will keep you informed with the market conditions. As you may or may not be aware there are extreme weather conditions due to the severe ooding in Spain sourcing Spinach (Prepack and Loose), Rocket, Iceberg, Little Gem and Cos are become extremely dif cult. 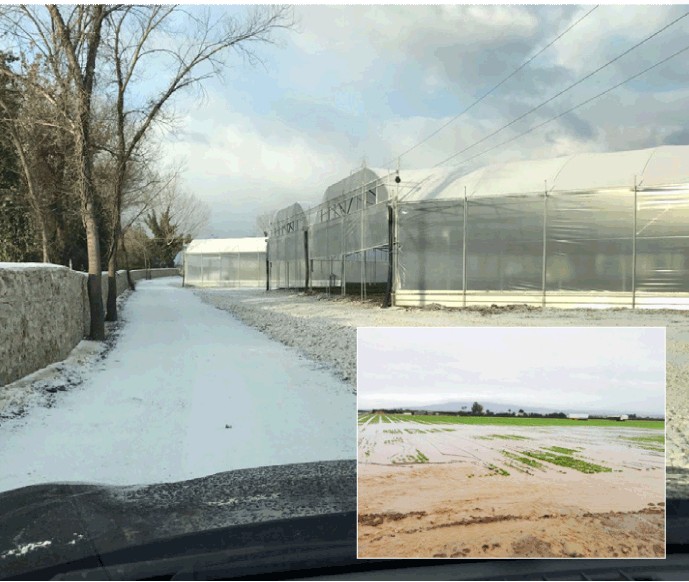 When we are unable to source these products from Spain we would usually source from Italy however due to the unexpected snow and freezing conditions this is also proving extremely challenging. Currently we cannot predict the exact length of the shortage and will keep you up-to-date. Broccoli is proving extremely short at present and the quality of the produce is not to our high standards, the wet weather is causing the head to rot in the elds whilst still growing. We strongly recommend using an alternative such as Cabbage. Cauli ower is also becoming extremely short, this is due to poor crop growth over Europe so everyone is trying to source from France, which is causing issuing when trying to purchasing the goods. All our Prepack Mushrooms are sourced usually from Poland however due to the snow there is very limited transport leaving Poland. The price of fresh Vanilla Pods has risen dramatically again and there are several reasons for this. We strongly recommend purchasing one of our alternative Vanilla items instead of (8877) Vanilla Pods 50s; (8878) Vanilla Paste ‘Little Pod’ brand 100g (this is equal to 20 pods worth of Vanilla) (3048) Vanilla Extract with Seeds 1ltr (31080) Vanilla Seeds dry 100g. the Source Trade Show, Westpoint, Exeter! We shall be there on the 8th Wednesday and 9th Thursday February! If you would like to come and see us, head on down! For more details please contact your Area Manager or visit the website: www.thesourcetradeshow.co.uk We’d love to see you there!